Originally from New York, Jordana then lived in New Hampshire before heading to Santa Monica in 1994 to study at Vidal Sassoon. Advanced training from Sassoon, Schwarzkopf, and Nick Arrojo is put to use in the workshops she teaches, and on projects such as photo shoots, celebrity work, weddings, and fashion shows around the world. A theater, language and International culture enthusiast, Jordana loves to travel and participates in several charitable fundraising efforts. Always hungry for knowledge, she specialized first in color, then hair extensions, then in Brazilian Blowout and keratin treatments, which she is often reviewed highly and blogged about. She received a Master Certification from Brazilian Blowout, their highest level of training, available only to the most experienced stylists, by personal invitation. And with Jordana, you can have your Brazilian Blowout or keratin treatment done in a private, elegant air-filtered suite! The newest product to revolutionize the hair care industry, Olaplex, is a staple in Jordana’s services, as it protects the hair from damage and even repairs damage that is already done. An Olaplex protective treatment comes standard in all her color services, and she often does Olaplex reparative treatments to help clients rejuvenate their hair after chemical or heat damage. Jordana has had all of these treatments done on her own hair, so she speaks from experience. She attended a lecture, demonstration and hands-on seminar/workshop with Brazilian Blowout™, then had the rare opportunity to work 1 on 1 with the creator of the process, doing a client together. This level of training is not even available anymore, as of 2009. She has completed Educator Training for Keratin Complex, and has the highest level of training from Global Keratin. 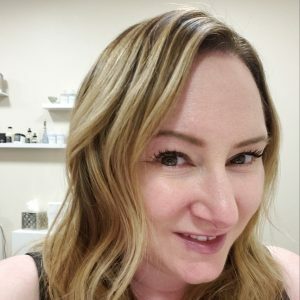 She has appeared on several of Olaplex’s social media platforms, and stars in their training video teaching stylists how to use to it enhance Brazilian Blowout and keratin treatments.